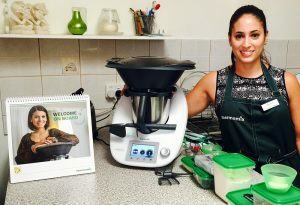 Thermomix in Australia recently announced the very exciting news that the Thermomix Recipe Platform is in the final testing phase. There’s always perks about being a Thermomix consultant and right now the best perk is being a part of the testing phase. I can’t wait until testing has finished and you all can have access to the platform. You will have access a wide range of Thermomix recipes from any device, wherever you are. How many times have you been out and decided you wanted to make a recipe from one of the cookbooks but unable to find out what ingredients you needed to buy. With the platform you will be able to upload recipes from your Recipe Chips into your collections and be able to access them at any time. You can also drag and drop recipes into the menu planner and create shopping lists for a particular day or for the whole week. You can edit the list so you only see what you need to buy and even add any other items you need to remember to buy. Then email the list to yourself to have handy on your phone or copy and paste items if you are an online shopper. The Thermomix Recipe Platform is the latest innovation to the digital world of Thermomix and with the Cook Key in development it’s just going to get even better!